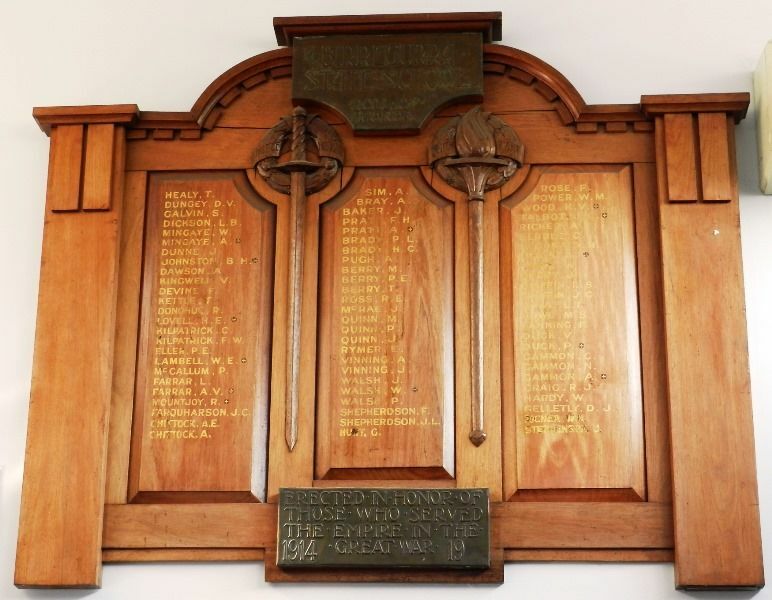 A wooden honour roll commemorates past pupils of the school who served in World War One. The honor board erected to the memory of past pupils who had attended the Birregurra State School, and who had or were serving in the present war, was unveiled before a crowded gathering in the main room at the school last Friday. The Hon. W. Hutchison, Minister for Education, performed the unveiling ceremony. In the course of a patriotic speech, the Minister paid a tribute to the citizens of Birregurra in complimenting them upon the erection of such a beautiful honor board. Mr Tate, Director of Education, was also present. He commended them for their patriotic work in the way of knitting, letter writing, etc. He quoted one instance of letter writing to soldiers where in the case a soldier at the front received no mail. The postman, seeing him turn away looking dejected, stopped him with the remark that there was a letter addressed to "A Lone Australian Soldier"; would that suit him? The soldier gladly assented, and on opening the missive found that it was from his own little girl. It appears that this happy little coincidence was brought about by a little girl from Ringwood, near Melbourne, writing a letter from her local State school. Mr Jas. McDonald, M.L.A., and Mr Parker, the district inspector of State schools, also spoke. During a most interesting speech, Mr Parker mentioned that so far as he knew Birregurra school held the record for an individual record for war week. He referred to the fact that an aforetime scholar had knitted the magnificent total of 250 pairs of socks. A fact that lent color to the proceedings was the presence of Major Eller, an old pupil of the school. Major Eller is an Anzac, and has put in over three years' service. He is home on furlough, and returns to the front at termination of his holiday. It was a most fitting incident that Major Eller's furlough should synchronise with the unveiling of the honor board on which his name is placed. Dr Kirkpatrick, who is chairman of the local school committee, in a short speech, mentioned that the honor board, which is also accompanied by a velum bound parchment leaven book, a page of which is to be devoted to each individual soldier, the book being enclosed in a beautiful blackwood glass case, cost exactly £40, and that there were 73 names on the board, with more to be added. The proceedings terminated with the singing of the National Anthem. Colac Herald (Vic), 28 June 1918.